My first SBrick-controlled model. Features advanced suspension system. 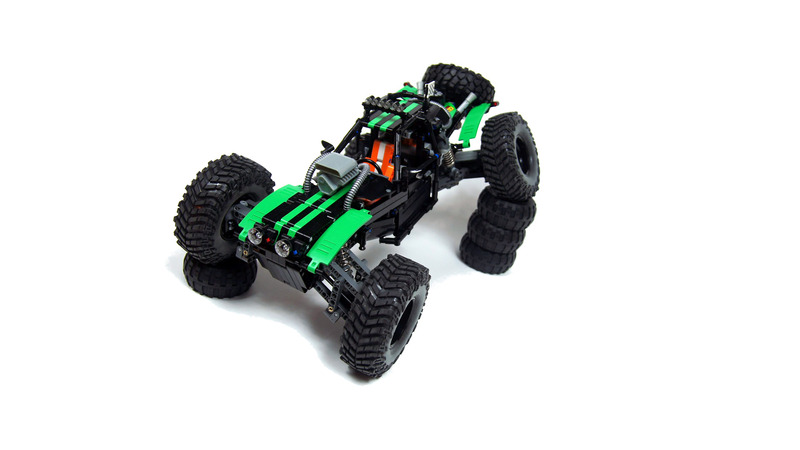 I’ve been thinking of building some generic baja/trophy truck for a while, especially since my first effort at a trophy truck turned out extremely ugly, and then somebody has shown Twin Hammers model to me. It was very inspiring, and I instantly liked the look and the sophisticated rear suspension system. 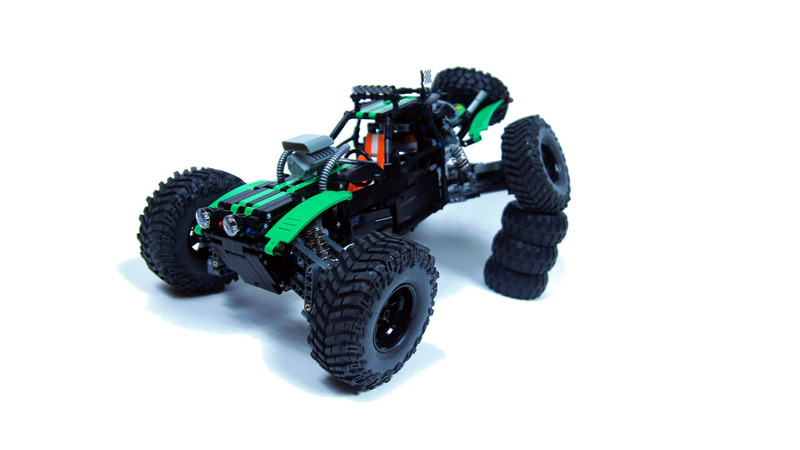 This model was designed as a simple test platform for the commercial SBrick version, for the custom Baja Claw TTC tires, for advanced suspension, and I also wanted to see what the 42039 set’s medium green pieces would look like when combined with black. 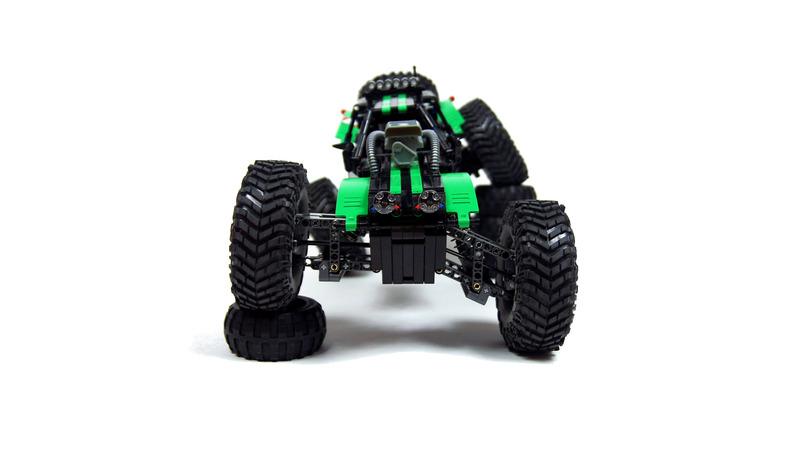 To this end, I wanted it to be fast and propelled by a pair of PF L motors driving the rear wheels directly, but the enormous wheels proved to require PF XL motors instead. 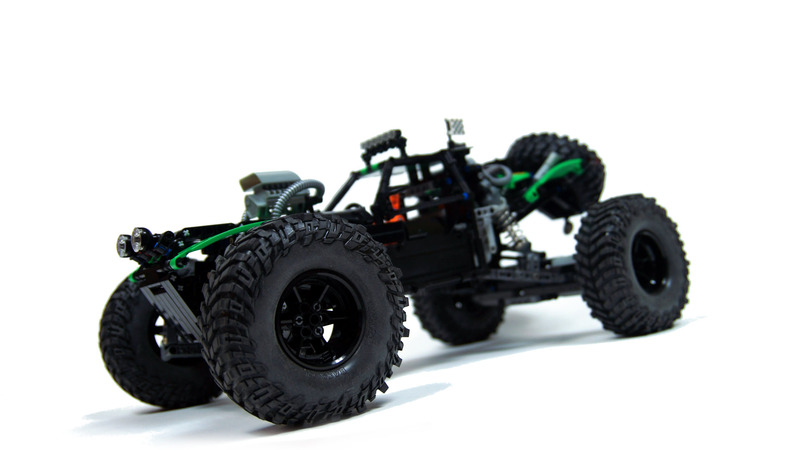 This meant the model was slower than intended, but it was still pretty agile and negotiated rough terrain with ease. 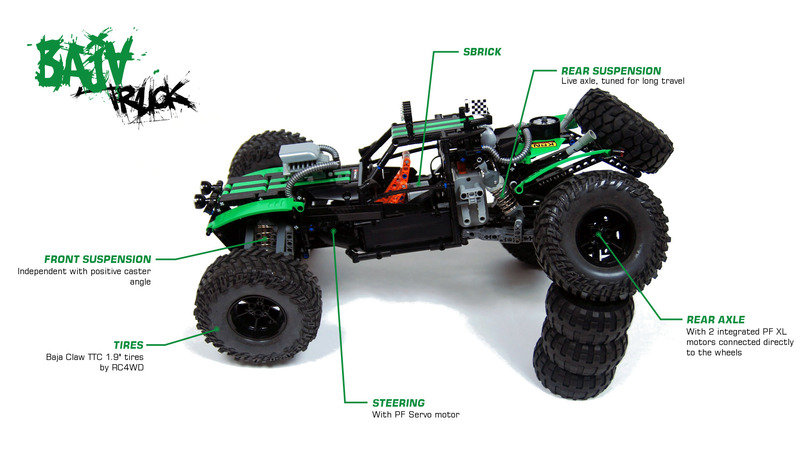 The suspension used four 11.5L adjustable LEGO shock absorbers, which proved crucial because their both ends can pivot. 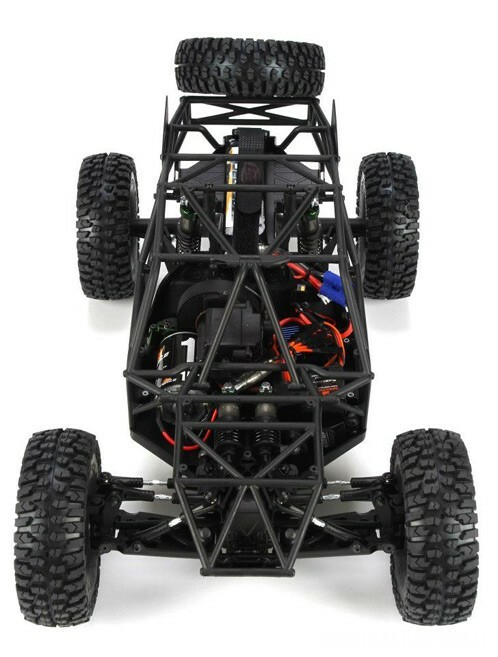 This allows mounting the shocks at complex angles, and it made the rear suspension possible. 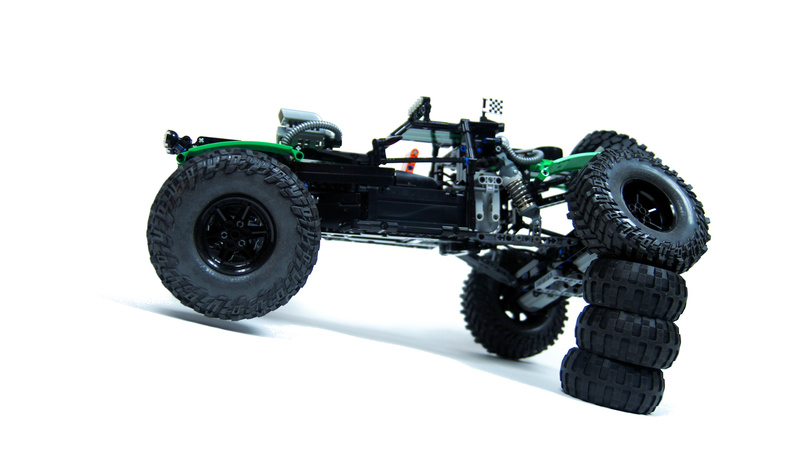 The suspension design, picked straight from the Twin Hammers, relied on a live axle connected to the chassis by four links forming the shape of W when seen from vehicle’s front. 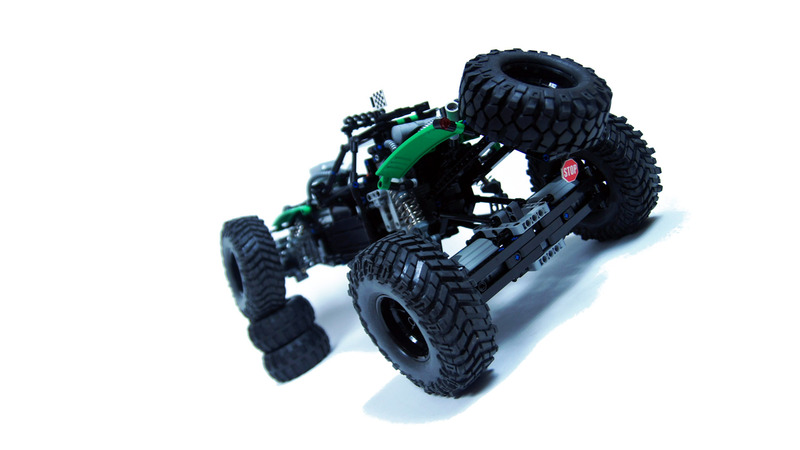 The inner links were simply Lego 9L steering links, while the outer links were much tougher and build with Lego suspension arms. Just like in the Twin Hammers, two shock absorbers were connected not directly to the rear axle, but to the outer links, near their middles. Lacking a driveshaft that would connect it to the chassis, the rear axle had a very little backlash left/right, but it had no observable impact on performance nor stability. 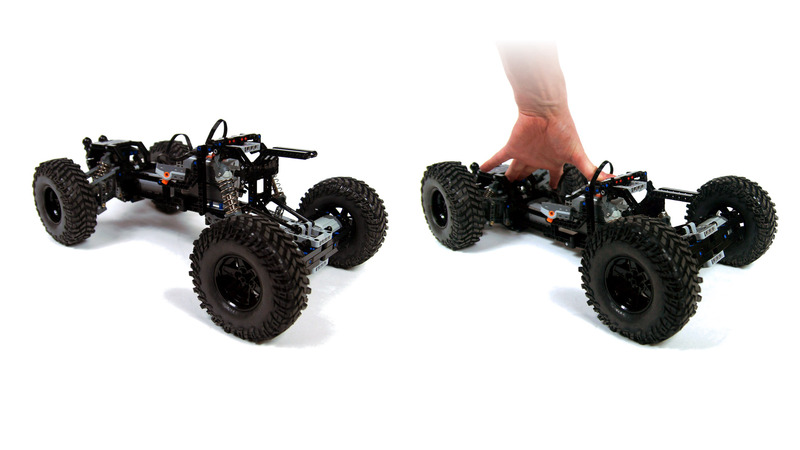 The resulting rear suspension had immense travel and was reasonably soft and responsive. 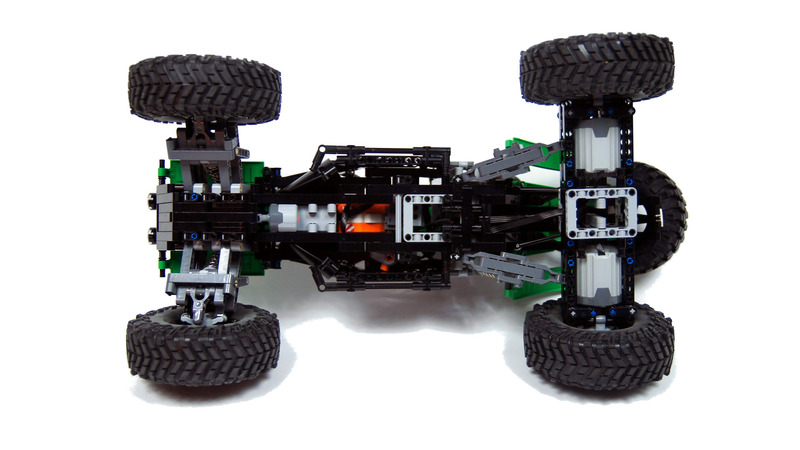 The front suspension was a typical independent suspension, built with Lego recent steering hubs and with suspension arms made wide enough for the thick 11.5L shock absorbers to go through the middle. My hopes for speed were reflected by a positive caster angle, which was achieved in a very simple way, as I wanted the front suspension to be as robust as possible: the entire front suspension was built as a standalone module, and connected to the chassis at angle. 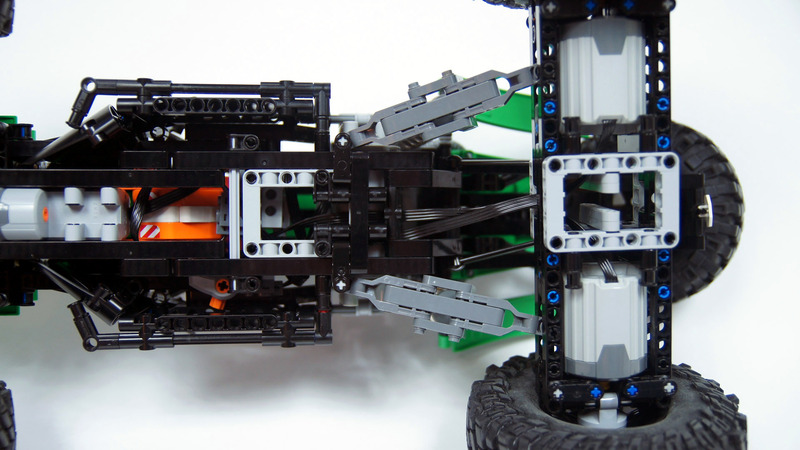 Two universal joints connected it to a PF Servo motor, which was sitting behind the front suspension, aligned with the chassis. With drive motors integrated into the rear axle and steering motor sitting close to the front one, I kept the body small, installing a standard PF battery box and one SBrick at the back of a small single-seat cabin. 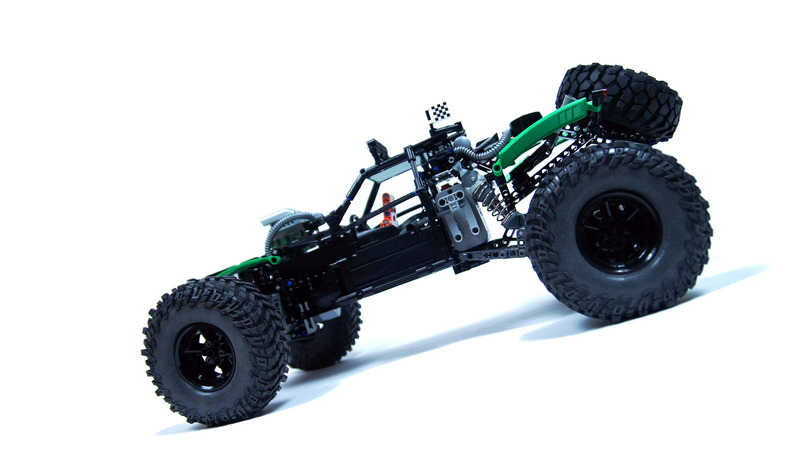 The resulting car was stable, with robust body, designed for bumpy ride. The tires performed splendidly, and the suspension proved to be very likely the best I’ve built so far, thanks to the long shock absorbers. There was also a huge difference in how the suspension behaved with all shocks in hard setting, so I kept them soft for most of the time (and for the entire video). The model was nothing special, but it was a pleasure to see it handle obstacles, and my only disappointment was the top speed. As for the SBrick, it performed without problems and I did not experience any issues with range, even at distances of around 20 meters. I have experienced some discomfort from steering with a smartphone, though. First, it wasn’t easy nor intuitive to control the model with a flat touchscreen which provided zero tactile feedback, unlike even simplest Lego or RC remotes. It was very often necessary to look either at the screen or at the model to see where controls were at a given moment. Additionally, cold weather made it difficult to keep fingers exposed for prolonged periods of time, although my smartphone provides a “glove mode”, which I have not tested yet. Second, every time I woke my phone after putting it into pocket for a moment, I had to wait for it to reconnect with the SBrick. This was perhaps a software issue that will be fixed in the future, but every time there was annoying period of time, of varying length, during which the model remained totally unresponsive to commands. Still, this seemed like something that could be solved or circumvented, or less noticeable under more favorable conditions. There are foam inserts there, and I’ve never tested any 2.2″ tires. Since 1.9″ tires fit pretty well, I guess 2.2″ ones would be too large. I simply braced them with Technic beams, nothing fancy. 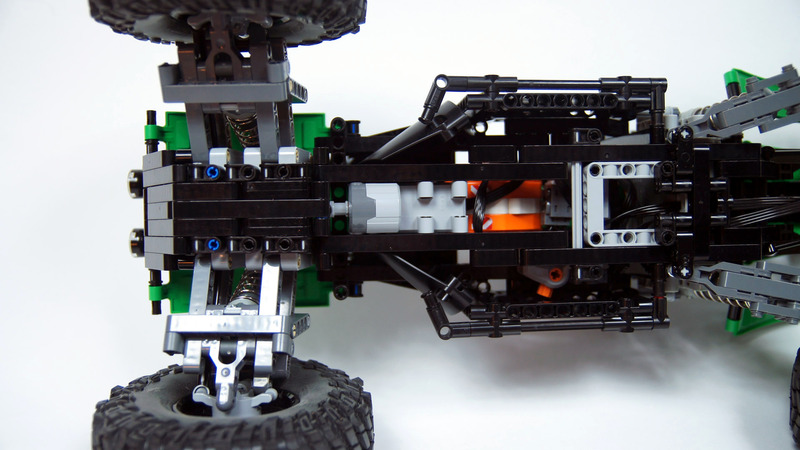 There is easily a dozen of Lego sets that will show you how to build a steering system, like 9398, and there are some instructions at my Download page that might help you. 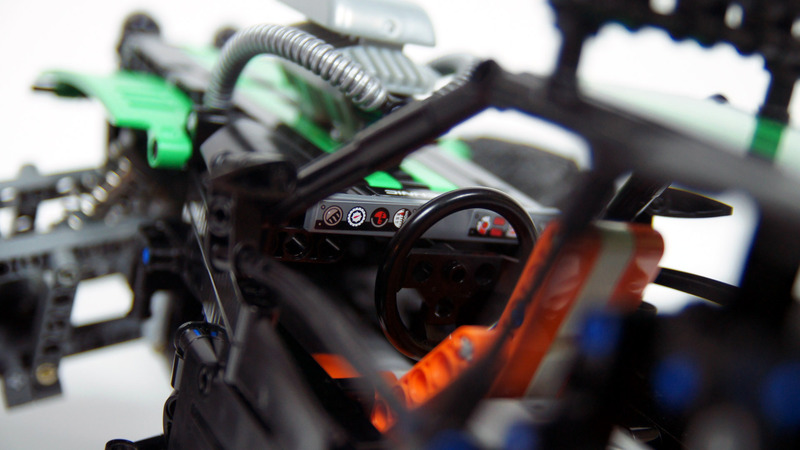 How did you make the steering? I have 3 M engines, 2 for driving and I was wondering how I could use the 3rd to steer a car? I mean, I have an idea of how, but it’s not very efficient, like, it’s pretty bulky, and I was just curious how you did it. 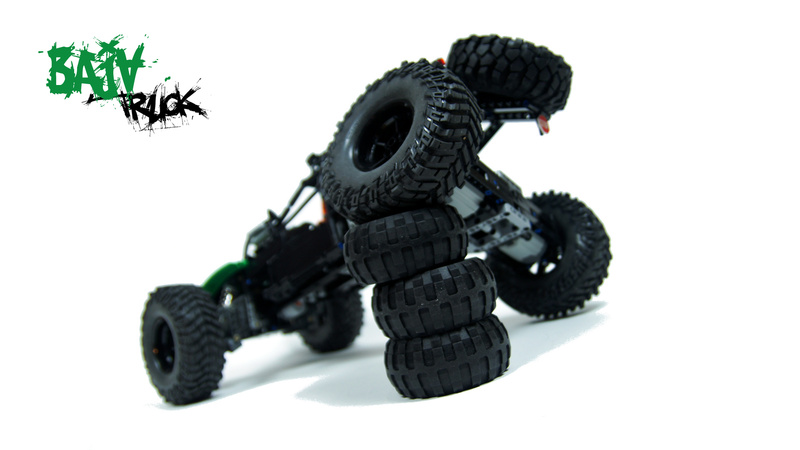 Plus I’m just using balloon tires, and I don’t want the axel to too wide from one side to the other. So the scale doesn’t look off. Btw the suspension is simply amazing, you should try more stuff like this! How did you secure the wheel hubs to the motors? I’m building a truck with this design myself, but I can’t figure that part out. Today, after months of work, I finished this model in a 3D program. Now to order the parts and build it. 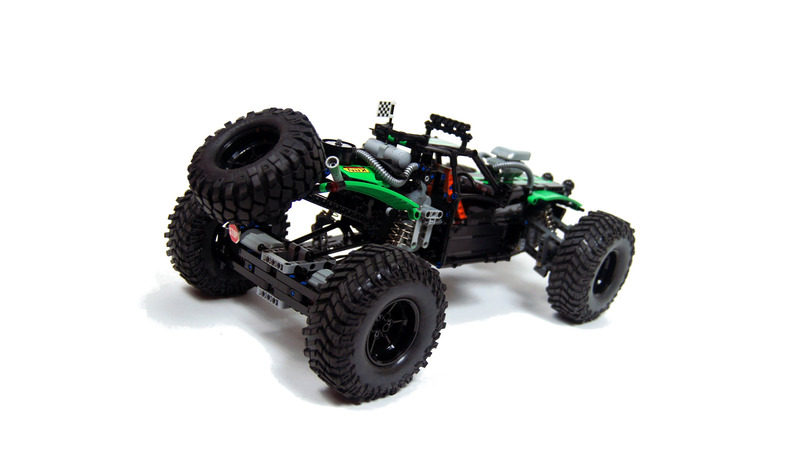 I know this is an old build for you but do you remember the LEGO hub you used for those tires? I love the suspension and look of it I want to build something like it but I don’t have the patience. I don’t think I’ll ever get bored of your creations, even if it has like 8 versions like the tiger tank. 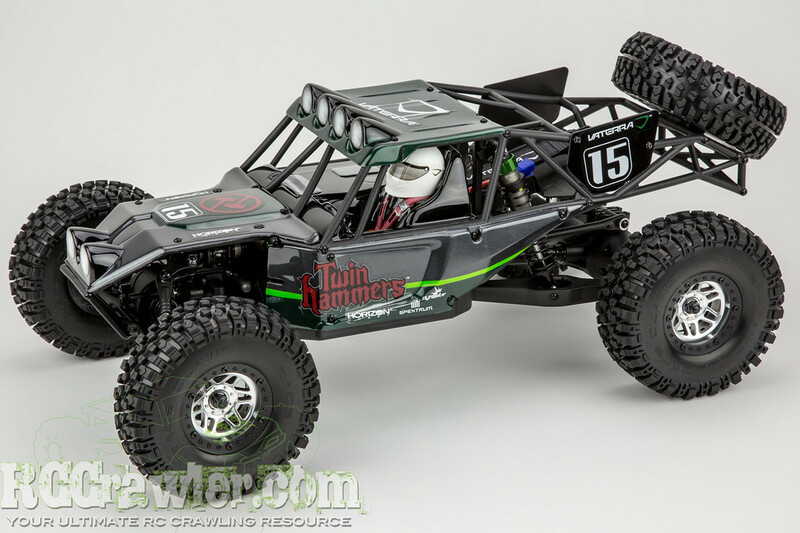 Do you have a list of parts for the drag-line style rear-end? Working on a scaled version of a Silverado Trophy truck that is based off the 1.9 Baja Claws. Thanks. Są inne. Mniejsze, krótsze i tańsze. Wspanialy model! Jestem noobem w technic, ale ogladajac twoje kreacje ucze sie szybko. Masz moze jakas alternatywe na twoje shocks? $32 za jeden to troche za duzo na moj budzet. 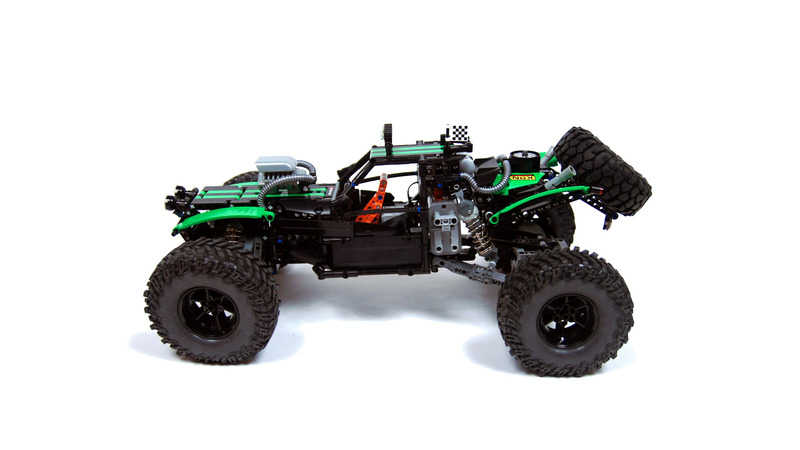 Models like this with custom parts and sBrick control looks for me like next generation of lego technic. Keep reinventing lego!!! Yes, you need a switch to revert one motor, so that directions of both match. 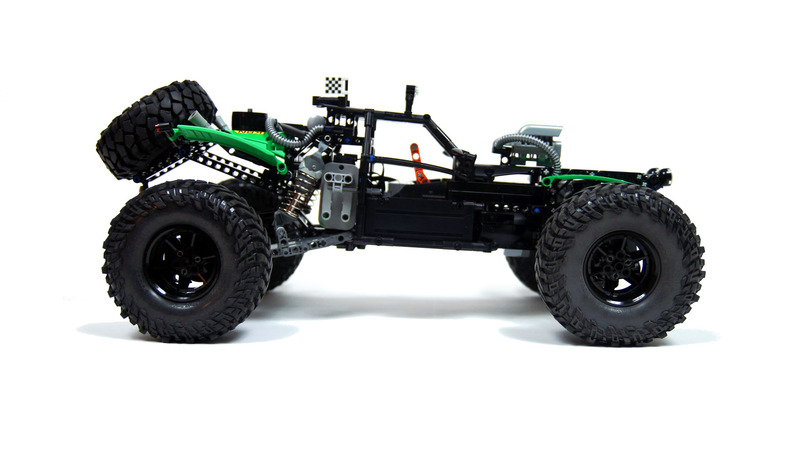 I’m building my first moc: rc hotrod. 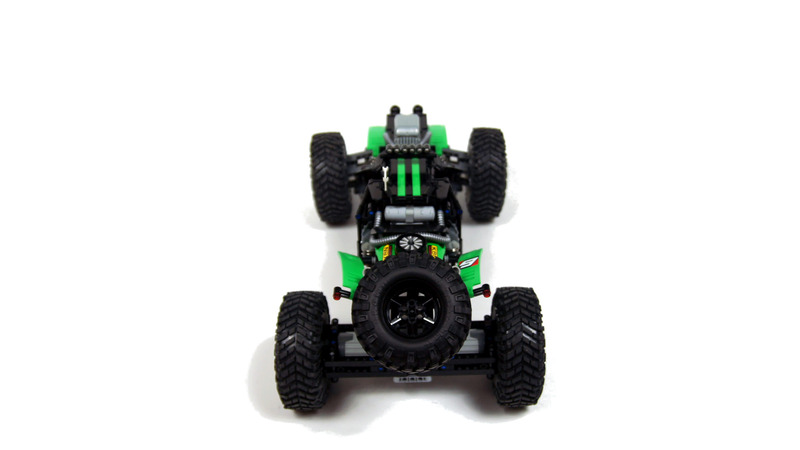 I tried direct drive like your baja, but the problem is the wheels are spinning in opposite directions. Do I need that switch I see on your pictures? How to solve this? Look, you could put ev3 brick in the model and use another ev3 brick as the remote. But SBrick has no way of sending back data such as angle of the front wheels, and you’ll need a real-time reading to maintain accuracy. SBrick acts one way only, it only receives data and you’re talking about two-way data transfer that is only possible between two ev3 bricks. Essentially, your solution is adding the entire ev3 brick just to replace a differential. A solution that is heavier, bigger, and software-dependent. Not to mention that there is simply no SBrick-ev3 interface of any kind as far as I know. I ‘m afraid you didn’t understand me. The idea is to have the Ev3 in your hands and the Sbrick in the model, with the Ev3 acting as a remote. 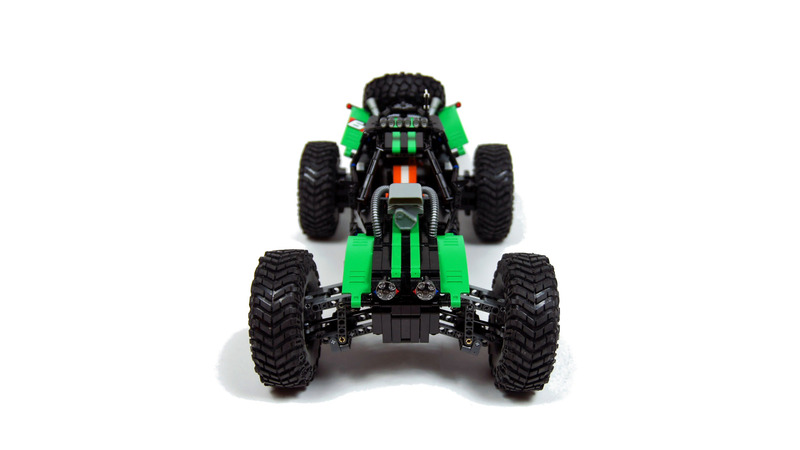 So it would simply send commands you give it (via sensors or whatever) to the Sbrick, but would also automatically calculate the difference in speed of the inner and outer rear wheel depending on the angle of the front wheels(Of course if that is zero there isn’t any difference at all).It then would multiply these values with the desired driving speed and make the sbrick run the rear XL’s at the speeds it got out. 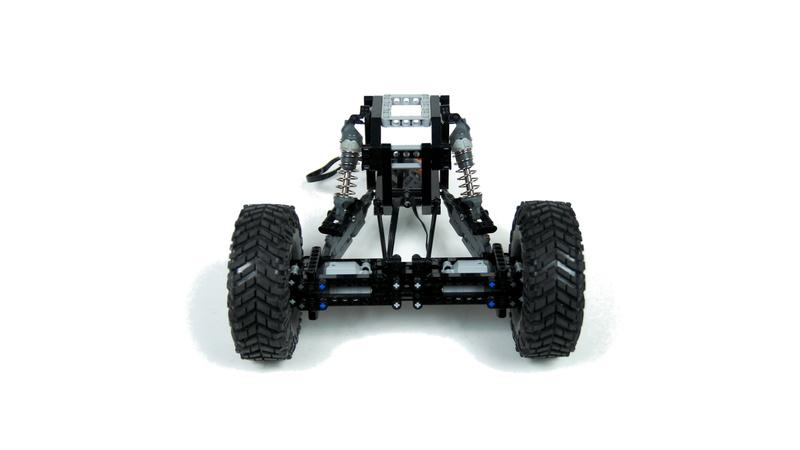 It would also transmit the steering commands to the servo motor. It would repeat that whole process all the time as fast as possible. So the rear wheels would always rotate with the speed they would have if there was a diff. Of course values like the wheelbase or the width of the vehicle would have to be entered manually before the first use (it would use them for it’s calculations and store the results on it’s memory for all times so if you used it then it only had to “look up” these values, math them with steering angle and desired speed and send that to the Sbrick).Such a design would offer all the advantages of a diff and all the advantages of your drivetrain.Also it wouldn’t make the model any heavier, would eliminate the need for a smartphone sa a remote and would offer the possibility of further customisations. I hope you understood everything, I would understand if not 😉 . Thank you, but I really think it can be quite easily built from the photos and description, especially the WIP photos. Sorry to disappoint you Jon, but Lego Ideas is at best a poor publicity stunt. They have never approved anything Technic, nor anything larger than 500 pieces, and they are discarding 99% of submissions without even giving a valid reason. This entire program is a marketing effort to make Lego look good, nothing more. They’re only happy to jump on ideas that let them earn a lot of money with minimal effort, like the Minecraft sets which are basically bunch of printed plates, and they can ruin even the submissions they approve, like they did with the DeLorean car. 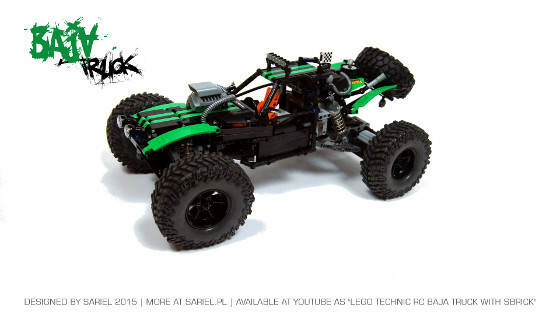 Also, do you really think a model with SBrick and third-party tires would make a valid entry? I honestly doubt a software will make any model go faster. More likely, the added weight of the EV3 unit will slow it down. Have you thought about writing building instructions or submitting it to Lego Ideas at https://ideas.lego.com/? It is AMAZING! 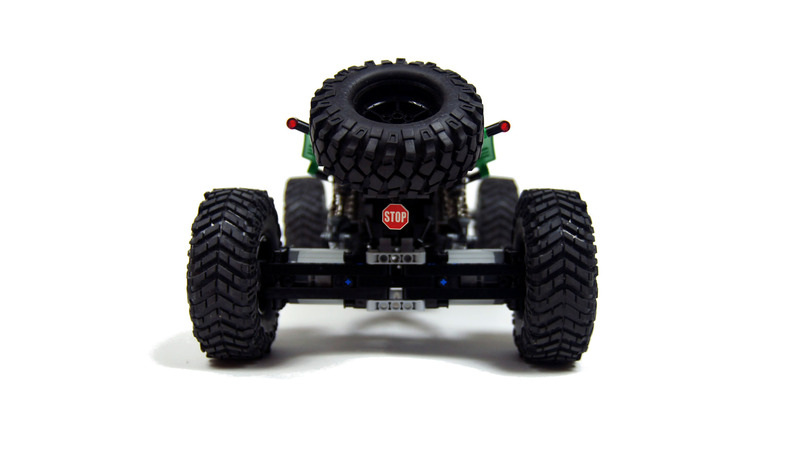 With Ev3 , ev3dev and a bluetooth stick it’s possible to control the SBrick with a program in a language of your choice – which would allow vehicles like this to have a “virtual diff” and thus drive smoother and faster. I shared everything I have here. A masterpiece of a Baja Truck. It is a pitty that there are no building instructions. Do you have more pictures to share with us, and do you have a list of parts you used, i like to build my own, looking forward to youre response. 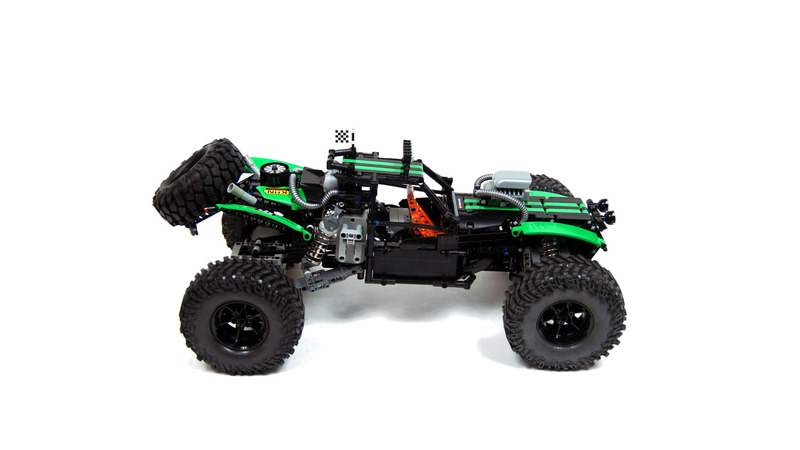 the twin hammers RC is 4wd, u should make this 4wd too. Wspominali że myślą o takiej możliwości, ale póki co nie słyszałem żadnych konkretów. Pytanie co do sbricka . Niektóre telefony sony mają możliwość podłączenia gamepada od playstation,podobnie jest chyba z urządzeniami samsunga. Czy ludzie od sbricka przewidują aby kiedykolwiek można było poprzez aplikacje przypisywać funkcje modelu do rzeczonego gamepada, a tym sam nim sterować moc? Zgadzam się że sterowanie przez dotyk nie jest zbyt komfortowe, a dzięki dwóm joystickom pada i wielu przyciskach można by było sterować praktycznie każdym modelem bez odrywania palców od dżwigienek i przycisków. I agree that the main drawback with those Baja tires is that they require substantial torque to drive. I currently don’t have any XL motors available, so I’ve had to resort to hard-coupling two L motors for my heavier MOCs, and the top speed is somewhat underwhelming; still, I remain impressed with the handling of the tires themselves. First!!! – Awesome, as usual. I always learn something watching your vids! – Thanks for the great post.